The L.U.C Lunar One flagship model of the L.U.C collection is now available in a new limited edition. 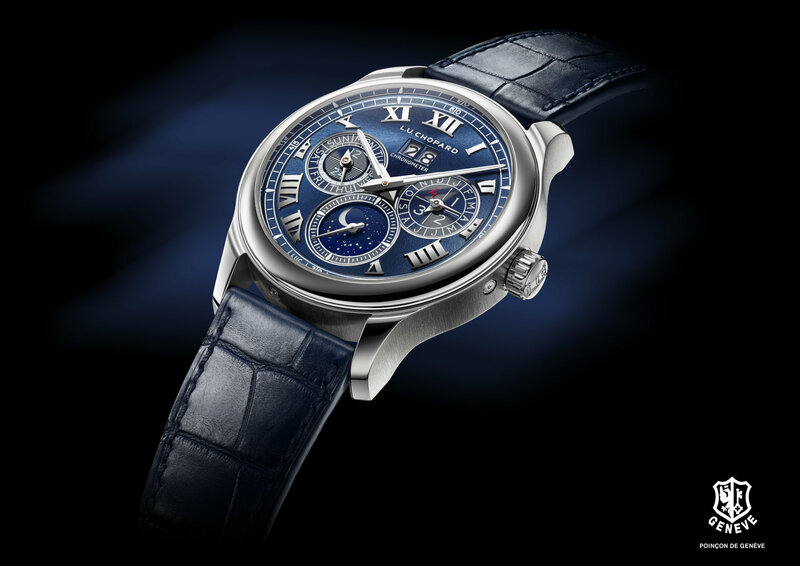 Chopard’s perpetual calendar model with astronomical moon-phase display appears attired in 950 platinum framing a deep blue sunray-patterned dial. The Manufacture’s vision of extreme horological complexity is thereby treated to a rare, precious and extremely elegant interpretation bearing the Hallmark of Geneva. This classic masculine model, governed by elaborate rules of symmetry and optimal legibility that endow it with a perfectly balanced appearance, is introduced this year in platinum. Graced with harmonious proportions and exceptional elegance, the L.U.C Lunar One is a watch designed for daily wear. Its multiple indications, its elaborate finishing, as well as its classic and masterful play on colours, make it a perfectly legible miniature watchmaking masterpiece. The L.U.C Lunar One is an essential item for modern gentlemen who are connoisseurs of excellence and betokens a pronounced taste for exceptional objects. Its special status within the L.U.C collections has led Chopard to offer the L.U.C Lunar One in this exceptional version. It is treated to an unusual interpretation representing a shining mark of distinction: a 100-piece limited series with a case entirely made of 950 platinum. This supremely noble and totally unalterable metal features a dark, neutral grey colour. The 43 mm-diameter case is adorned with vertical satin-brushed sides along with a polished bezel and lugs, thereby creating pleasing textured effects that further enhance its visual depth and interest. 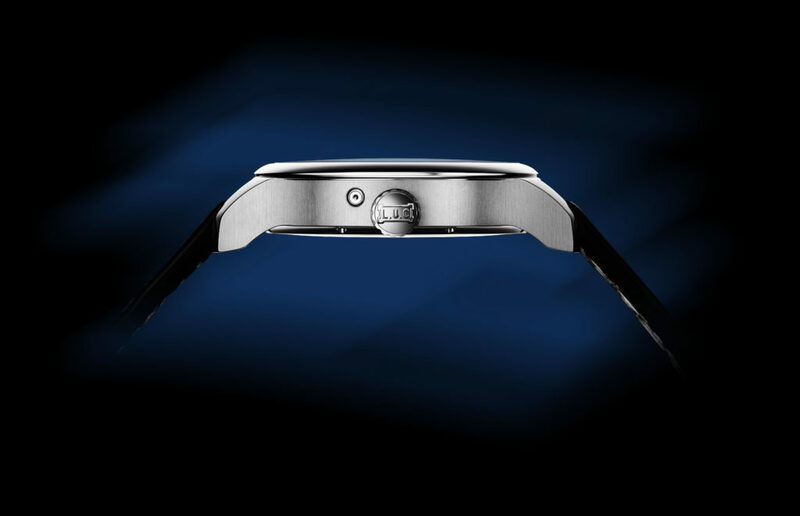 This case makes an impeccable match with the multilevel dials of the L.U.C Lunar One. Its surface is a firmly on-trend and wonderfully chic and royal blue. 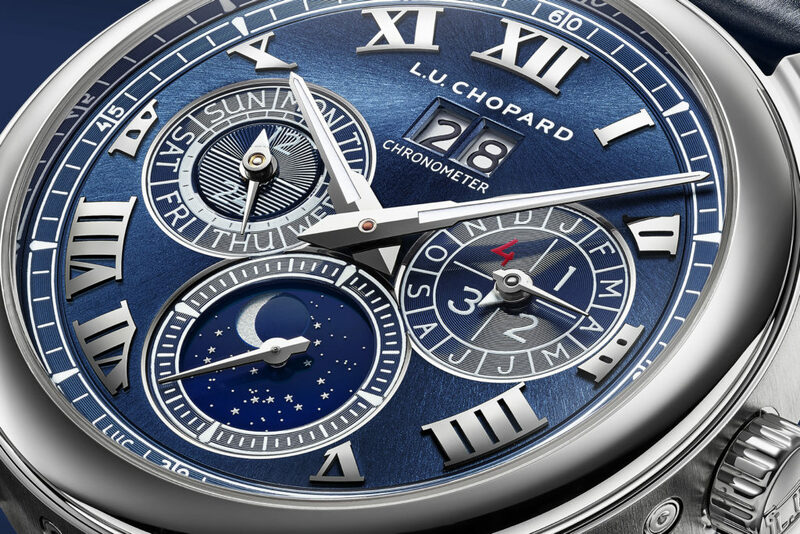 Its sunray pattern radiates from the L.U.Chopard logo positioned at noon. This signature of the L.U.C collections naturally draws the gaze, appearing in a white shade that stands out against the rest of the dial. The perpetual calendar indications appear on a lower level, surrounded by bevelled rims that effectively highlight them. Their fonts are white so as to ensure perfect readability. The large applied Roman numerals with their own distinctive font are mirror-polished. A deep blue sky, studded with the actual stars of the Northern Hemisphere, also features a depiction of the moon that infuses this watch with an unmistakable touch of poetry. Calibre 96.13-L is a gem in the crown of Chopard Manufacture. Its perpetual calendar always gives the correct date, whatever the length of the month and including February with its exceptions. It is distinguished by its unique moon-phase display. The latter is not merely a disc rotating beneath the dial, but instead a complex set of components indicating the exact appearance of the moon. This orbital moon imitates the path of the evening star. Skilfully set by the finest Chopard watchmaking artisans, this display boasts astronomical precision, since it will take 122 years to accumulate a one-day time lag compared with the actual moon and only then will it require adjustment. The L.U.C Lunar One is one of the very rare perpetual self-winding calendars, as well as part of an even smaller number to be equipped with a micro-rotor. The latter made of solid 22-carat gold is incorporated within the movement thickness which makes it slimmer and allows the owner to admire it in the most beautiful way. 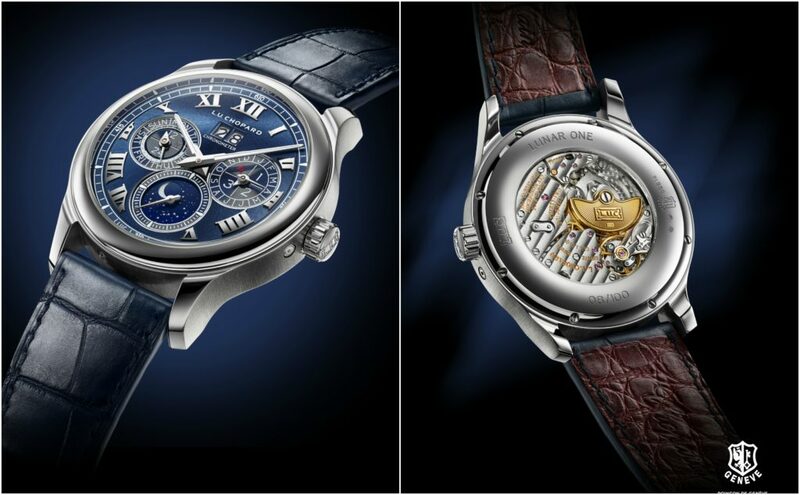 Engraved with the historical L.U.C logo and finely guilloché-worked, it epitomises the extremely sophisticated finishing lavished on calibre 96.13-L. With its bevelled bridges adorned with a Côtes de Genève motif, its circular-grained baseplate, its mirror-polished steel parts and its regulator with swan’s neck adjustment, not only does it meet the highest quality standards of Chopard Manufacture, but also bears the prestigious Poinçon de Genève quality hallmark to which Chopard has remained loyal for many years. This twin aesthetic and technical certification is approved by an independent authority and governed by a law promulgated by the Canton of Geneva. It dictates the peerless criteria of excellence relating both to the case and the movement in terms of its structure, appearance and accuracy. In keeping with the decisions taken by Mr Karl-Friedrich Scheufele, co-president of Chopard and head of development at L.U.C, this precision is also certified by the COSC, the Swiss Official Chronometer Testing Institute. A truly comprehensive watchmaking artwork, the L.U.C Lunar One in platinum showcases the very best of Haute Horlogerie as practised by Chopard Manufacture. 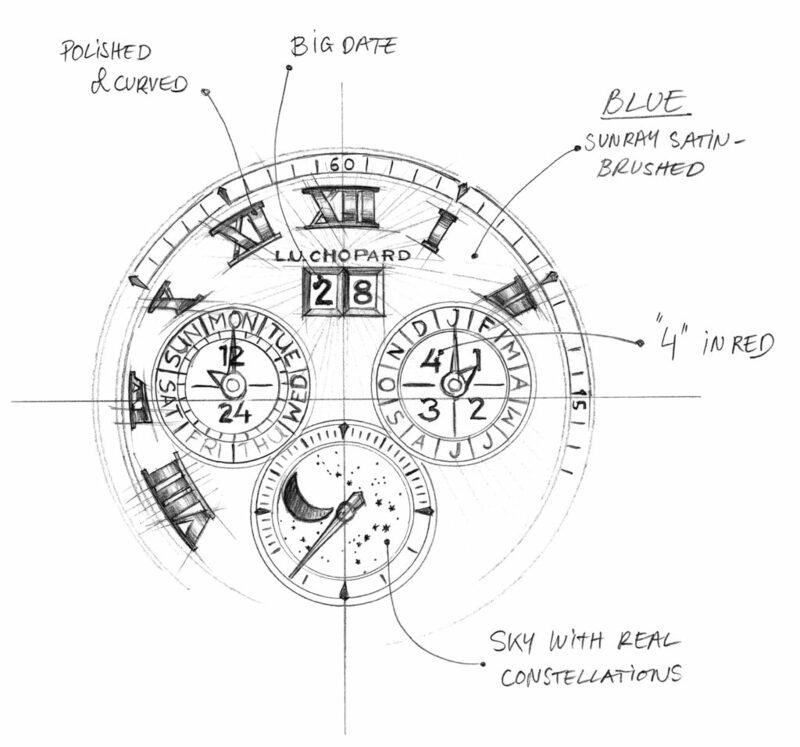 A high-precision astronomical and chronometric movement. Superb finishing throughout, as attested by the Poinçon de Genève quality hallmark. A supremely noble metal clothing an impeccably proportioned case. An elegant and eminently legible set of colours. The Lunar One is indeed a rare watch – and not only because it is issued in a one-hundred-piece limited edition. The Chopard L.U.C Lunar One watches can be found in Malta, exclusively available at the Edwards Lowell boutiques in Valletta and St Julian’s.